Supporting the right to equal treatment, self-determination, and freedom from discrimination, especially as concerns the rights of marginalized individuals and groups. 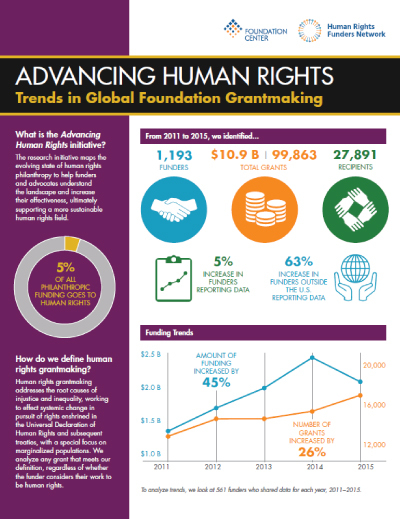 These are partial figures based on a subset of foundations that shared grants data all five years: Read more about our methodology. Human Rights and the Sustainable Development Goals: Are the SDGs living up to their promise to leave no one behind? Top three categories shown in default view. Add or remove regions using the legend below. Add or remove populations using the legend below. Add or remove strategies using the legend below. Description For a statewide partnership engaging educators, law enforcement, the juvenile justice system, local media, parents, and students in a community-based approach to dismantle longstanding systems of institutional racism and bias in the school system. Description To attend a Disabled Peoples' International meeting in Kenya to report on implementation of the CRPD, share challenges, and develop an implementation system and plan future activities.